Will the innovations brought by converging technologies for improving human performance augment or eliminate humans? Without any doubt, mechanization brings advantages. If nothing else, mechanization eliminates human error by eliminating jobs. That is the purpose of mechanization. It brings down the size of payrolls while it improves the quantity and quality of production and reduces the unit-cost of production. Robots don't take coffee breaks. They don't go on strike and are always on the job on Blue Mondays. They don't take sick-leave and they don't even talk back to the boss or ever give him the finger. The only reason why mechanization has never yet eliminated people  other than that machines were designed, produced and used for the large-scale killing of people in "military" actions or in genocidal exterminations  is because nobody has so far made a serious effort to mechanize humans, but that is now changing. Government agencies in the U.S., in Japan and in Europe are hard at work to create a hive mind and hope to have it working by the end of the 21st century. With knowledge no longer encapsulated in individuals, the distinction between individuals and the entirety of humanity would blur. Think Vulcan mind-meld. We would perhaps become more of a hive mind  an enormous, single, intelligent entity. The U.S. National Science Foundation, the U.S. Department of Commerce and their allies in Japan and Europe hope to bring about that ultimate goal, to promote and establish a global hive mind by the end of the 21st century. They posit that not only is that goal feasible but also that it is quite likely to be achieved during the course of this century. The process they use is to converge efforts in the fields of nanotechnology, biotechnology, information technology, human cognition and social sciences by giving them a common goal, the creation of electronic brain-to-brain and machine-to-brain interfaces, the creation of built-in brain- and body-enhancers. The aim is to create artificial intelligences that will logically and eventually merge into one single super-intelligence. The new intelligence, perhaps a hybrid of human and machine thought, will ostensibly be able to give immortality to humans. If thoughts and conscience can be transmitted electronically, they can also be stored electronically  theoretically indefinitely. The new intelligence or hive mind will live in and by means of the Internet and be tightly and directly interconnected with manufacturing processes for the production of consumer goods and with processes that will monitor, control, improve and optimize its existence and functioning. The government- or government-funded agencies collaborating on creating the hive mind as of now chose the abbreviation NBICS (Nano-Bio-Info-Cogno-Socio) to name their combined global efforts, although in some variations of that acronym the S (for Socio) is written small or has been left off entirely, which is a bit of a give-away. Not only will the hive mind have been brought to life by the end of this century, it will offer the lure of immortality, enhanced body functions and vastly improved brain power for all those who join it, giving them virtually instantaneous communication with one another and making them potentially unimaginably powerful. That what makes us human and what comprises mankind, e. g.: individual personalities, will then no longer exist. There will no longer be the need to feel pain, hunger, lust and pride. Gone, too, will be the need for humans to reproduce sexually, and they will no longer require material possessions. How can that vision possibly fail? After all, it will save the globe, and the proponents of that vision insist that the end of mankind by transforming it into the hive mind is the only way by which the globe can be saved. Mack White (in Television and the Hive Mind) warns, though, that a hive mind is without fail ruled by a queen. That is true of the ants, the termites and the bees, but it may be that the hive mind will become so totally and tightly integrated that it will be the queen and nothing else. It will have no use for soldiers or armies, for politicians, administrators and workers. All work necessary to maintain itself, to bring about the elimination of mankind and to save the globe, will be done by machines that it will control directly without human intervention. Therefore mankind will be neither needed nor wanted. Mankind will be replaced. Mack White's article drew my attention to the U.S. Government report Converging Technologies for Improving Human Performance. When I first read his commentary, I saw that he was telling the truth about the rapidly progressing evolution of propaganda strategies and tactics. At first I had misgivings about Mack White's claim that the ultimate goal is to achieve not only a hive-mind mentality for mankind but to transform mankind into a hive mind in spirit and in body. I thought that, surely, he had chosen the expression hive mind because he had taken the view of a science fiction writer in describing a hypothetical concept. After I downloaded the report Converging Technologies and began to read it, I soon saw that I had assessed his commentary wrongly and that Mack White is absolutely and totally correct in every aspect of it. The tool that will be used for the creation of the global hive mind is miniaturization of data processing devices by bringing the size of data storage elements down to the molecular level. The principle to be used for data storage will be to alter the orientation of the spin of individual electrons, to switch each on and off by altering its orientation, and thereby to make it possible to have electronic data processing devices in which the smallest components are the size of individual molecules and only a few nanometers or less apart. Thereby it may be feasible to reduce the size of computers with processing power equal to the human brain to a size that will theoretically be smaller than the human brain. These computers will not only be super-small, their data storage and processing capacity will be vastly greater than that of super computers. Moreover, these super-small, super-powerful super computers will be super-fast, about a thousand times faster than the human brain. The next logical step is to use these super-small computers for the storage of some or all of the knowledge of individual people. After that it becomes an inevitable progression to electronically link the "minds" so stored, thereby joining them into a hive mind. Through that the knowledge of individual "minds" becomes accessible to all other stored "minds". The consequence of that will be that individual "minds" can gain access to any portion or all of the knowledge stored in the hive mind, but why stop there? Theoretically, the power of the hive mind to use and process data will be unprecedented and of unimaginably large proportions, quality and speed. The wish and the will to convert mankind to a hive mind exists. Moreover, powerful government agencies and government-funded research laboratories are hard at work to make that wish into reality by the end of this very century. It is a logical progression in evolution guided by man's- and not God's will. The developed nations ignore and even abrogated God. In some instances they outlawed respect and all mention of Him, which not even Stalin or Hitler had brought to pass. Still, humans have a fundamental yearning for God. Even those who hate Him prove through their hatred of Him that God exists  never mind whether anyone lives with or by God's rules, feels that God's rules are arbitrary human inventions or thinks that a better human existence can be created by abolishing what he thinks is a useless, archaic, superstitious concept. As soon as mankind abolishes God, the deeply-felt fundamental human yearning for God will nevertheless then require that mankind put itself into the place of God  not only on Earth but also within our galaxy. Yes, the galaxy, as the proponents of the hive mind propose in essence that it is mankind's duty to become a hive mind for two reasons, to save the globe and to conquer the galaxy. Moreover, they say that without mankind becoming a hive mind, Earth will perish and with it all of mankind, and that mankind has no practical method at its disposal by which to begin the conquest of our galaxy unless mankind metamorphoses into a hive mind. It seems that a better title for the U.S. Government report on the state and goal of the effort to transform mankind into a hive mind would be Making Mankind into God. Once mankind has become a hive mind, individual humans will no longer exist. The authors of Converging Technologies state that pain, hunger, lust and pride will no longer exist, but they are not going far enough in their description of the hive mind. Also gone will be love and respect by fellow humans for each other. Gone will be the capacity even to hate one another. However, none of that will matter very much because when the hive mind exists mankind will be dead, and God will still be the all-powerful creator. Mankind's suicide through becoming a hive mind, too, will be proof of His existence. There can be no life without God. Mankind's denial of God is mankind's death. It is not a question of whether but when that death will occur, and the following excerpts for Converging Technologies contain the time table. That statement appears to be based on- and contains faulty logic. If, as the authors state on page 165 of their report, personalities may no longer exist on account of the inability of individuals to experience pain, hunger, lust and pride, would it then not follow that then the capability to wish for pleasure or even to feel it no longer exists, and that to cater to it is then no longer necessary? In the hive mind, pleasure is as much of a nuisance as is pain. "Intelligences akin to humans"? Akin may mean nothing anymore. The hive mind intelligence will not be mankind and quite possibly not even be kind to man. Why complicate the design of the hive mind if a far simpler design will suffice? In the end, the purpose of the hive mind is to serve the Earth Goddess and to do that by eliminating the physical existence of mankind with all of its needs and greed. If the hive mind residing in the Internet does not manifest itself as individual personalities, what single-minded objective will it have, what goals will it seek, and how will it see itself? Once it is aware of itself and in control of manufacturing processes, will it feel compassion for mankind or see mankind as a potentially dangerous competitor or perhaps as a danger to Earth that needs to be eliminated? When the "[Internet] intelligences begin to merge and transform themselves in novel ways", what will they see as the purpose of their existence? Can mankind control how the hive mind sees that purpose and what that purpose will be? That seems impossible. Let's not forget that the intent is to make the hive mind vastly superior to mankind. The "human" cognition and communication that is to be expanded will ultimately be no longer human but that of an artificial intelligence. Once mankind no longer exists in its current physical and spiritual form, would it not be a logical conclusion to limit the design of the hive mind to serving only its own purpose and not that of mankind? It seems to be quite obvious from the report that Mankind is the problem, and that to eliminate it in its totality  even to prevent all of its manifestations in the hive mind  should and will be the ultimate goal. Besides, to eliminate mankind is an objective that is much more easily achieved than to construct an electronic simulacrum of it, especially within the limitations under which the hive-mind project-team labours. They admit that they don't understand what comprises a personality. How can they then hope to understand mankind? How can they possibly hope to create a global hive mind that successfully represents the complexity of mankind if they don't even understand what comprises the personality of an individual human? No, it is quite apparent that the easiest way out of those complications is to create a servant for Gaea that no longer resembles or even cares for mankind at all. n Evolution transcending human cell, body, and brain? It is understood that NBIC should be used in a way that diminishes the discrimination against disabled people, advances their acceptance and integration into society, and increases their quality of life. Why not? Firstly, it would be political suicide for anyone to oppose the creation of tools that will improve the lives of the disabled. Secondly, it would seem that there are very few people who wouldn't want to avail themselves of teleportation, even if it is only in virtual reality. The real thing, such as in "Beam me up, Scotty," will likely require far more time than we can ever hope to find. It does not seem possible that teleportation can be designed and put into operation without having the hive mind doing at the very least the major portion of the design work required for that. Perhaps the hive-mind, with its independent, vastly superior logic will decide that teleportation is a waste of bandwidth, resources and, moreover, a luxury that mankind no longer needs because it did or will vanish anyway on account of mass suicide. The hive mind: will it bring the rebirth or the end of humanity? That depends on the answers to the questions raised in this article or on the answers to similar questions raised elsewhere. The powers wish to construct a global hive mind, but they also wish to reduce the world population to pre-Columbian levels, apparently both in an effort to save Gaea. It proved considerably more difficult than anticipated to reduce the world population at the desired rate to the desired number of 300 million to one billion people. Still, current UN population statistics indicate that population decline is now a stark and frightening reality for all of the developed nations and for a large and growing number of UN member nations. UN population projections indicate that by 2150 the world population will have declined to 3.5 billion people. Nevertheless, the U.S. NSF and U.S. DoC report pays no attention to that projection. 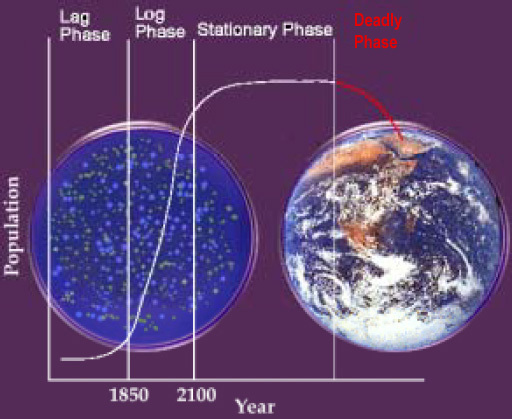 Instead, it compares the closed environment of the Earth to that of a microbial community growing in a Petri dish and shows images of a Petri dish and Earth, side-by-side, with a superimposed graph of exponential population growth and catastrophic collapse. Now, that is propaganda in action. Even Goebbels could not have done better: "Create a hive mind to solve the (non-existent) population explosion in the world, or we will all perish through catastrophic collapse of the population and/or environment." No mention is made of the fact that the world is producing more food than its people can consume. The report does not mention that farming in the developed nations has become a non-viable industry due to lack of sufficient demand for its products in the international market. Currently there seems to be not a single demographer in the world who ventured a guess as to whether the current world population trend toward rapid decline will level off or perhaps reverse itself. Is there no one who cares or dares to suggest that the hive mind could be put to use in solving the problem of the enforced death of all of mankind within the next few centuries? How will the hive mind feel about that, and what will it do? Will it nurture mankind to new and better levels of awareness and existence, or will it merely become a faster and better alternative for the final solution for the mankind problem, cleaning Gaea of mankind? In the meantime, birth rates keep falling and suicide rates keep rising. However, why should anyone busy with the important business of developing the hive mind trouble himself with that? Lower or virtually non-existent birth rates are said to be good for women's life-style choices, even though on account of falling birth rates social safety nets are collapsing and cause hundreds of millions of elderly women to experience neglect and poverty. The high and rising suicide rates affect primarily and almost exclusively men and boys, and who would want to worry about them? Besides, if enough people kill themselves because of the deconstruction of our families, love, respect and other social niceties, then there will be that much less and perhaps nothing left to do for the hive mind to detract it from catering to Gaea, and that will be a good thing, won't it? Those who kill themselves now because they experience the loss of love, hope and their purpose in life under rapidly deteriorating social conditions won't trouble the hive mind with the need to be exterminated later. We are made to think that nothing should interfere with the business of the new god being created, and nothing does, as of now. Presently we all (or most of us) contribute our taxes of whom a large amount of money is allocated to pay for the ammunition and the programs with which we all will eventually be eliminated. When we no longer let God guide us on the path to the end of our lives, what will? Nevertheless, the people who would transform mankind into God will certainly try, and they will demand that we pay for it all while they expect to make a good living being unsuccessful in trying to do the impossible  all the while claiming that throwing more money into the bottomless pit they are digging will help to bring them closer to achieving their goal. However, considering that mankind has come awfully close to acting as if it were a hive mind already, the futile efforts of the would-be-creators will most certainly have the result that we will come as close to being a hive mind as is humanly possible. For that we have a long way to go. We have not seen the worst yet. That is still to come. P.S. 2011 04 03: It has been a little over eight years since I wrote that. I read it through very carefully and found that as of now there is no reason for revising the opinions I expressed, except for some very minor edits to polish a couple of sentences. This morning I listened to the radio and heard part of a discussion with Dr. Charles Higgins from The Department of Neuroscience at the University of Arizona. He basically appears to be a proponent of much of what the preceding commentary targets, but he seems to have his feet a bit more firmly on the ground than the US National Science Foundation and the US Department of Commerce do. I gathered from that discussion that we are still a long way off from creating an artificial intelligence that comes close to competing with human abilities, let alone equal them. Some of the impressions I gained from listening this morning will be covered in this blog posting at Dads & Things. Many people have sensibly discussed teleportation. Here is a sample of their conclusions. If all of the world's people were located in the Province of Alberta (just a touch smaller in area than the State of Texas) and each were to have an equal share of all of the land in Alberta, then each of the world's people would have 98.6m2 of land to live on. Assuming that the average household consists of three people, a family of three would have enough space (3,184 ft2) for a moderately-sized house and a garden large enough to grow some of the food consumed by the family. It is obvious that the world's population density will be the controlling factor. Is that a problem? Will people any time soon be standing on each other's shoulders? How can the world be overpopulated if it is possible to fit the world population, fairly comfortably, into a province the size of Alberta or a state the size of Texas, even if we divide the whole population into families of three and give each a bungalow and a good-sized garden to boot? The following table list a number of nations, ranked by their population densities. Does anyone seeing those numbers still think that the world is overpopulated? There are in the order of about half a million or more people of age 55 and over in Alberta. If all of them were to join SUN, they would become the most powerful advocacy organization in Alberta; and seniors would no longer be robbed of their comforts and otherwise ignored. At the price of one package of cigarettes seniors will be able to gain a voice that will be heard by a government that otherwise can and will take from seniors what they worked for all their life to enjoy in their old age. 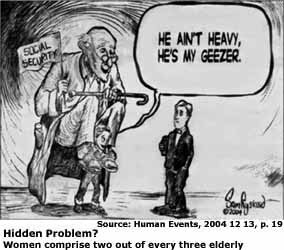 If you are concerned about how seniors are affected by the planned, systematic destruction of our families and society, a search at google.com (for elderly OR seniors OR grandparent OR grandfather OR grandmother site:http://fathersforlife.org) will provide you with the links to about 80 web pages at Fathers for Life that will be of interest to you.